Marx’s Value, Price and Profit was a series of lectures he delivered in 1865, even though it was first published in 1898. (1) “I might answer by a generalization, and say that, as with all other commodities, so with labor, its market price will, in the long run, adapt itself to its value; that, therefore, despite all the ups and downs, and do what he may, the working man will, on an average, only receive the value of his labor, which resolves into the value of his laboring power, which is determined by the value of the necessaries required for its maintenance and reproduction, which value of necessaries finally is regulated by the quantity of labor wanted to produce them. But there are some peculiar features which distinguish the value of the labouring power, or the value of labor, from the values of all other commodities. The value of the laboring power is formed by two elements—the one merely physical, the other historical or social. Its ultimate limit is determined by the physical element, that is to say, to maintain and reproduce itself, to perpetuate its physical existence, the working class must receive the necessaries absolutely indispensable for living and multiplying. The value of those indispensable necessaries forms, therefore, the ultimate limit of the value of labor. On the other hand, the length of the working day is also limited by ultimate, although very elastic boundaries. Its ultimate limit is given by the physical force of the laboring man. If the daily exhaustion of his vital forces exceeds a certain degree, it cannot be exerted anew, day by day. However, as I said, this limit is very elastic. A quick succession of unhealthy and short-lived generations will keep the labor market as well supplied as a series of vigorous and long-lived generations. Besides this mere physical element, the value of labor is in every country determined by a traditional standard of life. It is not mere physical life, but it is the satisfaction of certain wants springing from the social conditions in which people are placed and reared up. The English standard of life may be reduced to the Irish standard; the standard of life of a German peasant to that of a Livonian peasant. The important part which historical tradition and social habitude play in this respect, you may learn from Mr. Thornton’s work on Over-population, where he shows that the average wages in different agricultural districts of England still nowadays differ more or less according to the more or less favorable circumstances under which the districts have emerged from the state of serfdom. By comparing the standard wages or values of labor in different countries, and by comparing them in different historical epochs of the same country, you will find that the value of labor itself is not a fixed but a variable magnitude, even supposing the values of all other commodities to remain constant.” (Marx 1913: 115–119). (2) “These few hints will suffice to show that the very development of modern industry must progressively turn the scale in favour of the capitalist against the working man, and that consequently the general tendency of capitalistic production is not to raise, but to sink the average standard of wages, or to push the value of labor more or less to its minimum limit. Such being the tendency of things in this system, is this saying that the working class ought to renounce their resistance against the encroachments of capital, and abandon their attempts at making the best of the occasional chances for their temporary improvement? If they did, they would be degraded to one level mass of broken wretches past salvation. I think I have shown that their struggles for the standard of wages are incidents inseparable from the whole wages system, that in 99 cases out of 100 their efforts at raising wages are only efforts at maintaining the given value of labor, and that the necessity of debating their price with the capitalist is inherent to their condition of having to sell themselves as commodities. By cowardly giving way in their every-day conflict with capital, they would certainly disqualify themselves for the initiating of any large movement. At the same time, and quite apart from the general servitude involved in the wages system, the working class ought not to exaggerate to themselves the ultimate working of these every-day struggles. They ought not to forget that they are fighting with effects, but not with the causes of those effects; that they are retarding the downward movement, but not changing its direction; that they are applying palliatives, not curing the malady. They ought, therefore, not to be exclusively absorbed in these unavoidable guerilla fights incessantly springing up from the ever-ceasing encroachments of capital or changes of the market.” (Marx 1913: 124–126). These passages do show that Marx in Value, Price and Profit did think that capitalism has a tendency to reduce wages towards the “value of labor” which is “more or less to its minimum limit.” The market price of labour, whatever the rises and falls caused by supply and demand – still converges towards the value of labour-power. But the point is that Marx did not think that the “value of labour-power” was identical throughout every economy, and he did not hold that it is simply determined by the bare physical necessities to allow people to live and have children. Rather, he admitted a “historical and moral element” to what determines the “necessary wants” in some nations so that there could be differences in the “subsistence wage” or value of labour-power. This was partly determined by the historical and pre-capitalist standard of living and how the proletariat arose in each country in historical terms. But even so “the ultimate limit is determined by the physical element,” and Marx seems to think that capitalism drives wages towards a level that is made up of (1) the “physical element” and (2) whatever additional commodities that the “historical and moral element” in each country can continue to add to a bare physical minimum even under capitalism. Marx, Karl. 1913. Value, Price and Profit (ed. by Eleanor Marx Aveling). Charles H. Kerr & Company, Chicago. You really can’t get someone more left-wing on the American political spectrum than Ralph Nader – that is, without going to communism or Marxism. And yet here he is below giving us a badly-needed left-wing perspective on why open borders and mass immigration are a bad idea. And he is perfectly right too. I put forward a similar case here. Yet another thing to add is this: with open borders, Keynesian fiscal policy and policies to create full employment are badly thwarted and disrupted, because as your economy booms your open borders just allow more people to flood in and create more unemployed and more competition for jobs. This is an interesting point about Marx’s economic theory: he rejected the orthodox Classical “iron law of wages.” Nevertheless, there are still severe problems with Marx’s theory of wages. So what was Marx’s view? The view he published to the public in his own lifetime is mainly to be found in volume 1 of Capital. Here Marx thought that workers receive a wage that is equal to the value of labour-power. This appears to be what the capitalists deliberately pay, rather than some inevitable law of nature. “The value of labour-power is determined, as in the case of every other commodity, by the labour-time necessary for the production, and consequently also the reproduction, of this special article. So far as it has value, it represents no more than a definite quantity of the average labour of society incorporated in it. Labour-power exists only as a capacity, or power of the living individual. Its production consequently presupposes his existence. Given the individual, the production of labour-power consists in his reproduction of himself or his maintenance. For his maintenance he requires a given quantity of the means of subsistence. Therefore the labour-time requisite for the production of labour-power reduces itself to that necessary for the production of those means of subsistence; in other words, the value of labour-power is the value of the means of subsistence necessary for the maintenance of the labourer. Labour-power, however, becomes a reality only by its exercise; it sets itself in action only by working. But thereby a definite quantity of human muscle, nerve, brain, &c, is wasted, and these require to be restored. This increased expenditure demands a larger income. If the owner of labour-power works to-day, to-morrow he must again be able to repeat the same process in the same conditions as regards health and strength. His means of subsistence must therefore be sufficient to maintain him in his normal state as a labouring individual. His natural wants, such as food, clothing, fuel, and housing, vary according to the climatic and other physical conditions of his country. On the other hand, the number and extent of his so-called necessary wants, as also the modes of satisfying them, are themselves the product of historical development, and depend therefore to a great extent on the degree of civilisation of a country, more particularly on the conditions under which, and consequently on the habits and degree of comfort in which, the class of free labourers has been formed. In contradistinction therefore to the case of other commodities, there enters into the determination of the value of labour-power a historical and moral element. Nevertheless, in a given country, at a given period, the average quantity of the means of subsistence necessary for the labourer is practically known. The owner of labour-power is mortal. If then his appearance in the market is to be continuous, and the continuous conversion of money into capital assumes this, the seller of labour-power must perpetuate himself, ‘in the way that every living individual perpetuates himself, by procreation.’ The labour-power withdrawn from the market by wear and tear and death, must be continually replaced by, at the very least, an equal amount of fresh labour-power. Hence the sum of the means of subsistence necessary for the production of labour-power must include the means necessary for the labourer’s substitutes, i.e., his children, in order that this race of peculiar commodity-owners may perpetuate its appearance in the market. In order to modify the human organism, so that it may acquire skill and handiness in a given branch of industry, and become labour-power of a special kind, a special education or training is requisite, and this, on its part, costs an equivalent in commodities of a greater or less amount. This amount varies according to the more or less complicated character of the labour-power. The expenses of this education (excessively small in the case of ordinary labour-power), enter pro tanto into the total value spent in its production.” (Marx 1906: 189–191). (3) the cost of education and training of the skilled forms of labour (Brewer 1984: 37). But Marx admits that different countries at different levels of development might have differences in “necessary wants” given to workers because of a “historical and moral element.” However, it is difficult to see how this can be greatly above the level needed for subsistence and reproduction of workers without the whole theory unravelling. If, for example, Marx’s “historical and moral element” in wage determination results in real wages greatly above subsistence wages and that keep rising, then his theory is bizarrely contradictory. If, however, wages in different countries might have some minor or moderate differences from the “historical and moral element” but still tend towards that national value needed for subsistence and reproduction, then the theory can be made coherent, but is still empirically false, as we can see from the data here. Furthermore, in Marx’s other writings like Value, Price and Profit (1865), he accepted that unions might increase wages above subsistence levels (Baumol 1983: 305), but a “reserve army of the unemployed” also acts to keep wages in check (Howard 2000: 1039). But the final and serious problem is that Marx’s whole theory of price determination in volume 1 appears to be overthrown in volume 3 (later edited and published by Engels after Marx’s death), where Marx admits prices do not tend to labour values. This would appear to apply to wages too, so that wage rates in volume 3 would not necessarily tend towards the value of labour-power (which is the level needed for subsistence and reproduction of workers) (Baumol 1983: 304). At that point, Marx’s theory of wage determination in volume 1 – like the theory of price determination there – falls apart. “Thus it comes about that the excessive labour of some becomes the necessary condition for the lack of employment of others, and that large-scale industry, which hunts all over the world for new consumers, restricts the consumption of the masses at home to a famine minimum and thereby undermines its own internal market.” (Engels : 308). A “famine minimum” strongly implies subsistence wages, or perhaps even something worse. Along with the constantly diminishing number of the magnates of capital, who usurp and monopolise all advantages of this process of transformation, grows the mass of misery, oppression, slavery, degradation, exploitation; but with this too grows the revolt of the working-class, a class always increasing in numbers, and disciplined, united, organised by the very mechanism of the process of capitalist production itself. The monopoly of capital becomes a fetter upon the mode of production, which has sprung up and flourished along with, and under it. Centralisation of the means of production and socialisation of labour at last reach a point where they become incompatible with their capitalist integument. This integument is burst asunder. The knell of capitalist private property sounds. The expropriators are expropriated.” (Marx 1906: 836–837). “Marx’s Capital, Volume 1, Chapter 6: A Critical Summary,” July 13, 2015. Baumol, William J. 1983. “Marx and the Iron Law of Wages,” The American Economic Review 73.2: 303–308. Engels, Friedrich. . Herr Eugen Dühring’s Revolution in Science (trans. Emile Burns from 1894 edn.). International Publishers, New York. Howard, Michael Charles. 2000. “Marx’s Wage Theory in Historical Perspective: Its Origins, Development, and Interpretation,” History of Political Economy 32.4: 1039–1041. Who said this about British Rule in India? “... we must not forget that these idyllic [sc. Indian] village-communities, inoffensive though they may appear, had always been the solid foundation of Oriental despotism, that they restrained the human mind within the smallest possible compass, making it the unresisting tool of superstition, enslaving it beneath traditional rules, depriving it of all grandeur and historical energies. We must not forget the barbarian egotism which, concentrating on some miserable patch of land, had quietly witnessed the ruin of empires, the perpetration of unspeakable cruelties, the massacre of the population of large towns, with no other consideration bestowed upon them than on natural events, itself the helpless prey of any aggressor who deigned to notice it at all. We must not forget that this undignified, stagnatory, and vegetative life, that this passive sort of existence evoked on the other part, in contradistinction, wild, aimless, unbounded forces of destruction and rendered murder itself a religious rite in Hindostan. We must not forget that these little communities were contaminated by distinctions of caste and by slavery, that they subjugated man to external circumstances instead of elevating man the sovereign of circumstances, that they transformed a self-developing social state into never changing natural destiny, and thus brought about a brutalizing worship of nature, exhibiting its degradation in the fact that man, the sovereign of nature, fell down on his knees in adoration of Kanuman, the monkey, and Sabbala, the cow. Marx, Karl. 1853. “The British Rule in India,” New York Daily Tribune, June 25, 1853. Today it would be regarded as extremely politically incorrect, but that doesn’t worry me, since I don’t have much respect for political correctness. (1) for all his sympathy with the plight of suffering people in India, Marx was clearly saying that (1) the worldwide communist revolution required the sort of social and economic breakdown in India that he also described in this article, and that (2) British imperialism was unwittingly bringing this about and that in the grand communist scheme of things, it was a good thing. How is this not apologetics for British imperialism? (2) as a pure counterfactual argument, let us assume that the Western European powers of Marx’s time had become communist, how then would the communist revolution have been achieved in the non-Western world? For example, say that Britain had been taken over by communists in 1848–1850. Such a government would have inherited the British East India Company’s rule in India. Would a British communist government have set India free or imposed direct British communist imperial rule in India? If the latter, what would a communist British Empire have looked like? To make my position clear, I think British rule in India was a terribly mixed bag. (1) British rule brought about the de-industrialisation of large parts of India, as I have shown here. (2) British incompetence, callousness and fanatical adherence to laissez faire brought about quite preventable famines in late 19th century India, as shown by Mike Davis in his book Late Victorian Holocausts: El Niño Famines and the Making of the Third World (2001). However, would communist rule have been better or even worse? Steve Keen speaks below on the catastrophe that is the Eurozone, and this is lecture 7 that is part of Keen’s course at Kingston University in the UK. A truly fascinating interview with the investigative reporter Seymour Hersh on US policy in Syria in the videos below. More here. Seymour Hersh’s article “Military to Military” in the London Review of Books is here. If true, we see here how US foreign policy is much more complex than people both on the left and on the right think. Empirical Studies showing that Prices are Correlated with Labour Costs do not Prove the Classical Marxist Labour Theory of Value! I can’t count the number of times some absurd apologists for Marxism cite some paper in my comments section showing prices are correlated with labour costs – as if this proves the classical Marxist labour theory of value. It does no such thing. The Marxist labour theory of value says much more than this. “The assumption that the commodities of the various spheres of production are sold at their value implies, of course, only that their value is the center of gravity around which prices fluctuate, and around which their rise and fall tends to an equilibrium.” (Marx 1909: 208–210). This is something very much more than the simple claim that prices are correlated with labour costs. “In various parts of the third volume Marx claims for the law of value that it ‘governs the movement of prices,’ and he considers that this is proved by the fact that where the working time necessary for the production of the commodities decreases, there also prices fall; and that where it increases prices also rise, other circumstances remaining equal. This conclusion also rests on an error of logic so obvious that one wonders Marx did not perceive it himself. That in the case of ‘other circumstances remaining equal’ prices rise and fall according to the amount of labor expended proves clearly neither more nor less than that labor is one factor in determining prices. It proves, therefore, a fact upon which all the world is agreed, an opinion not peculiar to Marx, but one acknowledged and taught by the classical and ‘vulgar economists.’ But by his law of value Marx had asserted much more.” (Böhm-Bawerk 1949: 39). The mere citation of empirical studies that show a correlation between hours worked/wage-bill data of workers and prices of commodities does not vindicate Marx. Prices are correlated with labour costs because labour costs are often a very important component of prices. No sensible person denies this. But so are energy costs for many industries. And so are non-labour factor input costs. You’d find a correlation there too, especially in capital/energy-intensive industries. Furthermore, if workers demand wage rises without their hours changing we would also find a correlation with prices. Böhm-Bawerk, Eugen von. 1949. “Karl Marx and the Close of His System,” in Paul. M. Sweezy (ed. ), Karl Marx and the Close of His System and Böhm-Bawerk’s Criticism of Marx. August M. Kelley, New York. 3–120. Marx, Karl. 1909. Capital. A Critique of Political Economy (vol. 3; trans. Ernst Untermann from 1st German edn.). Charles H. Kerr & Co., Chicago. It is illustrated perfectly by this news story here. This is an utter abuse of the term “racist,” and an insult to people who have genuinely experienced real racism. What is racism, if it is to have any coherent, sensible and defensible meaning? (1) the view that a certain group of human beings regarded as a “race” (whether the term is scientifically defensible or not) is significantly morally or intellectually inferior to other “races” because of genetics and heredity and these differences are ineradicable. (2) an irrational hatred or phobia of all people who are defined as, or regarded as, belonging to a particular “race,” very often on the basis of skin colour. Now racism, as we all know, has historically led to terrible and unjustifiable racial discrimination, even though technically this is a different, even if strongly related, concept, because a person might be privately racist in sense (1) or (2) but not engage in outward behaviour that is racially discriminatory. But some people are racist in sense (1) or (2) and engage in irrational racially discriminatory behaviour that cannot be justified in any way at all. Most other senses of the word “racist” today tend to be rhetorical tricks or smears, or gross perversions of the word’s legitimate senses. What is termed “racist” often tends to be merely bigotry and prejudice against some nationality or religious group (which are not races). Above all, the regressive left conflates culture with race – a truly bizarre and outrageous trick that is actually opposed to what the left has historically believed about human progress: namely, that many of the problems in the world are caused by bad environment, not by genes or biology. Culture is not race. So many cultural ideas are not biologically determined, and are flexible and changeable, and bad cultural ideas must be criticised and fought so that they will change. E.g., misogyny, honour killing, female genital mutilation, homophobia, etc. These cultural ideas are not in the genes and people on the left who scream “racism” when they hear criticism of a particular culture for these ideas are actually guilty of a bizarre and insidious racism in reverse: the implication that misogyny, honour killing, female genital mutilation, etc. are caused by genetics or heredity, when this is clearly not the case. Dave Rubin interviews Faisal Saeed Al-Mutar, an Iraqi dissident, human rights activist and atheist in the fascinating interview below, which should be of great interest to people on the left and right, for its many interesting insights. Dave Rubin is a liberal who has a series of great interviews in his show The Rubin Report, and he is a strong critic of the regressive left. 1. Labor: is the measure of value. However, actual labor in its exchange with capital has a lower value than labor embodied in the commodities for which actual labor is exchanged. Wages, the value of a definite quantity of actual labor, are always lower than the value of the commodity produced by this same quantity of labor and in which it is embodied. The question is indeed insoluble, if put in this form. It has been correctly formulated by Marx and then answered. It is not labor which has any value. As an activity which creates values it can no more have any special value in itself than gravity can have any special weight, heat any special temperature, electricity any special strength of current. It is not labor which is bought and sold as a commodity, but labor-power. As soon as labor-power becomes a commodity, its value is determined by the labor embodied in this commodity as a social product. This value is equal to the social labor required for the production and reproduction of this commodity. Hence the purchase and sale of labor-power on the basis of this value does not contradict the economic law of value. 2. According to the Ricardian law of value, two capitals employing the same and equally paid labor, all other conditions being equal, produce the same value and surplus value, or profit, in the same time. But if they employ unequal quantities of actual labor, they cannot produce equal surplus-values, or, as the Ricardians say, equal profits. Now in reality, the exact opposite takes place. As a matter of fact, equal capitals, regardless of the quantity of actual labor employed by them, produce equal average profits in equal times. Here we have, therefore, a clash with the law of value, which had been noticed by Ricardo himself, but which his school was unable to reconcile. Rodbertus likewise could not but note this contradiction. But instead of solving it, he made it a starting point of his Utopia (Zur Erkenntniss, etc.). Marx had solved this contradiction even in his manuscript for his ‘CRITIQUE OF POLITICAL ECOMONY.’ According to the plan of ‘CAPITAL,’ this solution will be made public in Volume III. Several months will pass before this can be published. Hence those economists, who claim to have discovered that Rodbertus is the secret source and the superior predecessor of Marx, have now an opportunity to demonstrate what the economics of Rodbertus can accomplish. If they can show in which way an equal average rate of profit can and must come about, not only without a violation of the law of value, but by means of it, I am willing to discuss the matter further with them. In the meantime, they had better make haste. The brilliant analyses of this Volume II and its entirely new conclusions on an almost untilled ground are but the initial statements preparing the way for the contents of Volume III, which develops the final conclusions of Marx's analysis of the social process of reproduction on a capitalist basis.” (Engels 1907 : 27–29). By the phrase the “law of value” Engels means the assumption underlying this problem: that commodities tend to exchange at their true labour values. (1) in volume 1 of Capital it is assumed that commodities tend to have prices at their true labour values, so that these prices also reflect the surplus value embodied in the commodities. (2) in turn surplus value determines profits, and it should follow that in such a system different profit rates prevail reflecting the different surplus values, e.g., an industry with much more constant capital and very little variable capital should have a lower profit rate than a labour-intensive industry with a great proportion of variable capital. (3) yet, under capitalism, competition supposedly tends to create a uniform average rate of profit and so neither (1) or (2) can be true. By volume 3, Marx tried to argue that this assumption was only an empirical reality in the pre-modern world of commodity exchange, and not in 19th century capitalism where prices of production were the anchors for the price system. But if it were really the case that Marx in volume 1 of Capital thought that the assumption quoted above only applied to the pre-modern world of commodity exchange, then the whole challenge Engels made to the world in the preface to volume 2 of Capital becomes utterly stupid and makes no sense. For then there simply was no transformation problem. No great problem to solve. In reality – and this is the crux – Marx left everyone with the impression that volume 1 of Capital was asserting that commodities tended to exchange at their true labour values, and that this was a “law of value” in 19th century capitalism. That is why the transformation problem was raised as a challenge for Marxist theory in the first place. Engels edited and published volume 2 of Capital in July 1885 (Wheen 2001: 385), but volume 3 of Capital did not appear until November 1894 (Wheen 2001: 385) – nearly ten years later. One wonders whether Engels – as he read the catastrophe that was Marx’s draft of volume 3 – delayed publication when he realised that when it was published it would cause derision and prove that Marx’s law of value in volume 1 was bankrupt. Engels also vehemently refused to relate Marx’s solution to the transformation problem to any private correspondents (even Marxists) or to have it printed separately before the publication of volume 3 (Howard and King 1989: 24–25). At any rate, when volume 3 was published that is essentially what happened, as reviewers like Achille Loria, Werner Sombart, Conrad Schmidt and Eugen von Böhm-Bawerk pointed to the terrible contradictions. In his Supplement to volume 3, Engels’ last ditch defence of the “law of value” in volume 1 was to retreat into the idea that commodities only ever tended to exchange for their true labour values in the pre-modern world of commodity exchange and that this had ended between about the 15th and early 19th centuries. But, then, why, if that had been his and Marx’s view all along, had there been any need to make such a big deal of the transformation problem in the first place? Why did Marx never give a clear and explicit statement in volume 1 of Capital to the effect that the law of value there was not meant to apply to 19th century capitalism? Why did he give example after example implying that 19th century capitalism was subject to the law of value? Engels, Friedrich. 1907 . “Preface,” in Karl Marx, Capital. A Critique of Political Economy. The Process of the Circulation of Capital (vol. 2; trans. by Ernst Untermann from 2nd German edn.). Charles H. Kerr & Co., Chicago, and Swan Sonnenschein & Co., London. 7–29. Howard, Michael Charles and John E. King. 1989. A History of Marxian Economics. Volume I, 1883–1929. Princeton University Press, Princeton, NJ. Wheen, Francis. 2001. Karl Marx: A Life. W. W. Norton & Company, New York and London. 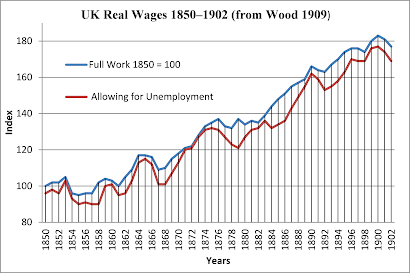 Our actual data on real wages from the late 19th century shows us this was false even then. It’s another Marxist theological dogma. To show why this is so, let us turn to some good empirical data. 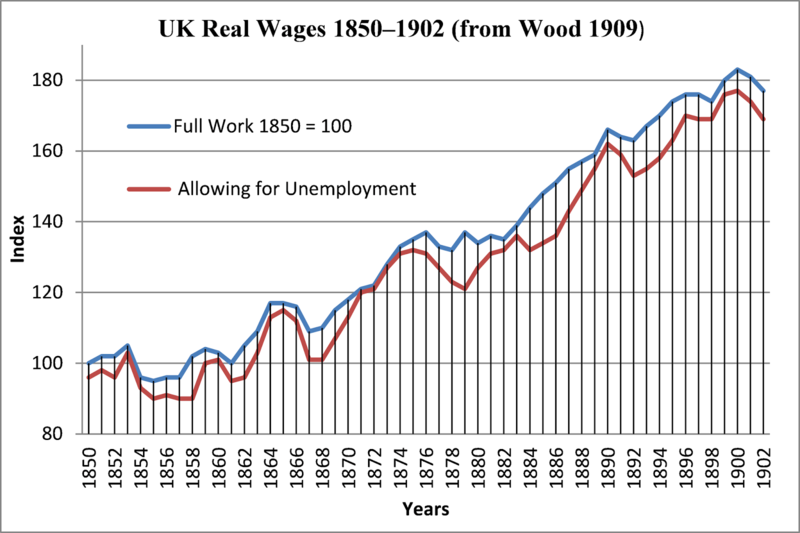 Wood (1909: 102–103, Appendix) gives data on UK real wages from 1850 to 1902, constructed from the wage data for working people in a whole range of industries, which can be seen in the graph below. As we can see, this rise in living standards was especially apparent in the deflation of 1873 to 1896, when nominal wages were generally sticky and prices fell, so that living standards soared, but was also perfectly well apparent in the inflationary periods before and after this bout of deflation. Perhaps Engels generalised from his limited experience and observations in the 1840s or 1850s, but in any case he was still wrong. Wood, George H. 1909. “Real Wages and the Standard of Comfort since 1850,” Journal of the Royal Statistical Society 72: 91–103. “The time is rapidly approaching when a thorough examination of England’s economic position will impose itself as an irresistible national necessity. The working of the industrial system of this country, impossible without a constant and rapid extension of production, and therefore of markets, is coming to dead stop. Free trade has exhausted its resources; even Manchester doubts this its quondam economic gospel. Foreign industry, rapidly developing, stares English production in the face everywhere, not only in protected, but also in neutral markets, and even on this side of the Channel. While the productive power increases in a geometric, the extension of markets proceeds at best in an arithmetic ratio. The decennial cycle of stagnation, prosperity, overproduction and crisis, ever recurrent from 1825 to 1867, seems indeed to have run its course; but only to land us in the slough of despond of a permanent and chronic depression. The sighed-for period of prosperity will not come; as often as we seem to perceive its heralding symptoms, so often do they again vanish into air. Meanwhile, each succeeding winter brings up afresh the great question, ‘what to do with the unemployed;’ but while the number of the unemployed keeps swelling from year to year, there is nobody to answer that question; and we can almost calculate the moment when the unemployed, losing patience, will take their own fate into their own hands. Surely, at such a moment, the voice ought to be heard of a man whose whole theory is the result of a life-long study of the economic history and condition of England, and whom that study led to the conclusion that, at least in Europe, England is the only country where the inevitable social revolution might be effected entirely by peaceful and legal means. He certainly never forgot to add that he hardly expected the English ruling classes to submit, without a ‘pro-slavery rebellion,’ to this peaceful and legal revolution.” (Marx 1906: 31–32). It is very clear what Engels is saying here: by 1886, he contended to his faithful Marxist readers, England was mired in a “permanent and chronic depression” which would not end until the proletarian revolution arrived. In reality, by 1888, there was a recovery in Britain and unemployment was falling again. The English working class remained largely impervious to Marxism. No proletarian revolution occurred, either by violence or in some democratic form (which, in the latter case, Marx thought might actually happen in the UK). Engels was – like so many Marxists – proven wrong. (3) a protracted period of deflation from 1873 to 1896, which sapped business confidence and investments. However, the proper explanation for this economic malaise will not be found in the cult of Marxism. Post Keynesian economics explains it perfectly well as I have shown in numerous posts (see below under “Further Reading”), and even the fact that money profit rates were indeed falling in the 1873 to 1896 period is explained by the prosaic reality that prices were falling in the face of nominal wage rigidity, not some theological Marxist belief that the rate of profit must have an eternal tendency to fall. In fact, even the neoclassical Alfred Marshall had a better understanding of the economic problems in this period than Engels or Marx ever did (e.g., see here and here). “Neoclassical and Quantity Theory Explanations of the 1873–1896 Deflation,” January 7, 2015. “More Evidence on the Profit Squeeze of 1873–1896,” January 5, 2015. “UK Gross Domestic Fixed Capital Formation in the 1873 to 1896 Deflation,” December 18, 2014. “Nominal Wage Rigidity in the US and the UK 1865/1880–1913,” December 16, 2014. “Armitage-Smith on the Profit Deflation of the 1873–1896 Era,” December 15, 2014. “UK Average Money Earnings 1880–1913,” December 14, 2014. “UK Real Per Capita GDP 1830–1913,” December 13, 2014. “British Money Wages in the 1873–1896 Deflation,” December 10, 2014. “Alfred Marshall on the Deflation of 1873–1896,” October 14, 2014. “UK Real GDP 1830–1918,” October 8, 2012. “Robert Giffen on the Deflation of 1873–1896,” December 7, 2014. “Alfred Marshall on Business Confidence,” December 3, 2014. “Alfred Marshall on Wage Stickiness and Debt Deflation,” November 30, 2014. “The Profit Deflation of the 1890s,” June 13, 2013. “Alfred Marshall’s Judgement on the “Depression” of 1873–1896,” June 13, 2013. “S. B. Saul on the Profit Deflation of the 1873–1896 Period,” June 14, 2013. Boyer, George R. and Timothy J. Hatton. 2002. “New Estimates of British Unemployment, 1870–1913,” The Journal of Economic History 62.3: 643–667. Chapter 9 of volume 1 of Capital is called “The Rate of Surplus Value” (Marx 1990: 320), and it discusses aspects of surplus value. A section by section summary follows. Surplus value is generated in production, and is value over and above the value of C (the capital advanced) (Marx 1990: 320). (2) v = variable capital. So C = c + v (Marx 1990: 320). An output commodity is produced and value equals (c + v) + s, where s is surplus value. The “capital advanced” C is c + v.
The surplus value arises only from variable capital, or that part of the capital C converted into labour-power (Marx 1990: 322). So, for example, machines cannot create surplus value (Harvey 2010: 128). The rate of surplus value is s/v (Marx 1990: 324; Brewer 1984: 43). It is important to note that s/C is the rate of profit and is distinct from the rate of surplus value (Brewer 1984: 43). “Necessary labour-time” is the part of the working day that the worker needs to work to pay for his own reproduction (Marx 1990: 325). “During the second period of the labour-process, that in which his labour is no longer necessary labour, the workman, it is true, labours, expends labour-power; but his labour, being no longer necessary labour, he creates no value for himself. He creates surplus-value which, for the capitalist, has all the charms of a creation out of nothing. This portion of the working day, I name surplus labour-time, and to the labour expended during that time, I give the name of surplus-labour. It is every bit as important, for a correct understanding of surplus-value, to conceive it as a mere congelation of surplus-labour-time, as nothing but materialised surplus-labour, as it is, for a proper comprehension of value, to conceive it as a mere congelation of so many hours of labour, as nothing but materialised labour. The essential difference between the various economic forms of society, between, for instance, a society based on slave labour, and one based on wage labour, lies only in the mode in which this surplus-labour is in each case extracted from the actual producer, the labourer.” (Marx 1906: 240–241). The necessary part of the working day is determined by the value of variable capital bought by the capitalist (Marx 1990: 326). This passage is also very interesting because Marx thinks that a slave-based economy also has surplus labour. But do slaves produce surplus value? Marx’s theory seems to deny that a slave can sell labour-power that creates surplus value. The rate of surplus value is also equal to the surplus labour divided by necessary labour (Marx 1990: 326; Brewer 1984: 43). “The rate of surplus-value is therefore an exact expression for the degree of exploitation of labour-power by capital, or of the labourer by the capitalist” (Marx 1906: 241). This, however, is not a measure of the absolute magnitude of exploitation (Marx 1990: 326, n. 7), but merely the degree of exploitation in relation to the ratio of surplus value to variable capital advanced (s/v). “The calculations given in the text are intended merely as illustrations. We have in fact assumed that prices = values. We shall, however, see in Volume III., that even in the case of average prices the assumption cannot be made in this very simple manner.” (Marx 1906: 244, n. 1). First, it is quite obvious that this footnote is referring to the examples given in the chapter and not throughout the whole of volume 1 of Capital. This is not some statement by Marx that the whole law of value in volume 1 is merely an analytical tool, and not empirical in any way, as some Marxist apologists want to make it out to be. Secondly, this is quite obviously one point where the inconsistent theory of prices of production that Marx had sketched in the draft of volume 3 of Capital (written prior to volume 1) has intruded into the text of volume 1. It is quite extraordinary that Marx never further explained this point about prices of production. If he had done so, of course, his whole theory in volume 1 would have quickly fallen apart, and later critics pointed to the damning inconsistencies between volume 1 and volume 3 soon after volume 3 was published. “To split up in this manner the product into different parts, of which one represents only the labour previously spent on the means of production, or the constant capital, another, only the necessary labour spent during the process of production, or the variable capital, and another and last part, only the surplus-labour expended during the same process, or the surplus-value;” (Marx 1906: 246–247). In essence, the total value of the output commodity is c + v + s (Harvey 2010: 130). This subsection is a description of Nassau W. Senior’s defence of manufacturers against the Factory Act (1833) and agitation for a 10 hour working day, and his idea that a reduction of one hour in the working day would destroy the net profits of manufacturers. However, this need not concern us, except to note that this is yet another section where Marx implies that his law of value is being applied to the 19th century capitalism, and not to some pre-modern world of commodity exchange (as he and Engels were later to state). Finally, the portion of the product that can be said to represent surplus value is called the “surplus product” (Marx 1990: 338). “The sum of the necessary labour and the surplus-labour, i.e., of the periods of time during which the workman replaces the value of his labour-power, and produces the surplus-value, this sum constitutes the actual time during which he works, i.e., the working day.” (Marx 1906: 254–255). Sombart, Werner. 1894. “Zur Kritik des ökonomischen Systems von Karl Marx” [Toward a Critique of the Economic System of Karl Marx], Archiv für soziale Gesetzgebung und Statistik 7: 555–594. Lexis, W. 1895. “The Concluding Volume of Marx’s Capital,” Quarterly Journal of Economics 10 (October): 1–33. Schmidt, Conrad. 1895. “Der dritte Band des Kapital,” Sozialpolitisches Zentralblatt 22 (25th February): 254–258. Sorel, G. 1897. “Sur la théorie marxiste de la valeur,” Journal des Economistes (March): 222–231. Wilbrandt, Robert. 1919. Karl Marx: Versuch einer Würdigung. B. G. Teubner, Leipzig. Wilbrandt (1919: 100) appears to have taken the same view as in Engels’ supplement that the law of value in volume 1 of Capital was to be confined only to the pre-modern world of commodity exchange, while Sombart and Schmidt struggled to see how the law of value in volume 1 was empirical at all in light of volume 3. Engels had a correspondence with both Sombart and Schmidt on the labour theory of value, and this is what prompted Engels to write the Supplement to volume 3. The importance of this letter and Engels’ supplement cannot be stressed enough for understanding and refuting the labour theory of value. If one reflects carefully on the left today, what Salman Rushdie says here is obviously true. Extreme multiculturalism is not just multi-racialism. Multi-racialism as a principle is right. The view that a country should not discriminate against people on the basis of skin colour or race is entirely right and moral. But culture is not race. So many cultural ideas are not biologically determined, and are flexible and changeable, even if no rational personal would deny that certain human traits and propensities are a complex mixture of biology and environment (e.g., height). More cultural diversity is not necessarily a good thing for a society, if this means more extreme religious fundamentalism, parallel legal systems and the introduction of values that radically conflict with the core values of a secular Western society (e.g., theocracy, gender segregation, homophobia, female genital mutilation, misogyny, etc.). As Rushdie says, extreme multiculturalism is cultural relativism. This is a very bad thing. An amusing but serious take on Postmodernism from Gad Saad, an evolutionary behavioural scientist. If what is described here is true, it is pure evil. Where are all the cultural relativists now? All those people who think all cultural beliefs or cultures are totally equal in every way? And, even worse, certain people on the left in the Western world still obsess over “safe spaces” and “culturally insensitive” Halloween costumes. These whining, narcissistic, intellectually crippled, infantile idiots make me sick, given how much real evil there is in the world. Here is a good example of it. Now, first of all, I do think Chomsky makes errors – and even some very bad errors in his political or economic thinking. This, however, is mostly laughable. Rubbish. Chomsky is a left libertarian. There is a clear social and economic vision in his thinking, but the problem is it is wrong, as I point out here. Chomsky’s anarcho-syndicalist libertarianism as a utopian fantasy, for the simple reason that a society without strong central government is unworkable – certainly in the modern world. However, Chomsky has the great virtue of being pragmatic in his politics. In his various comments over the years, Chomsky has had the good sense to tacitly admit that his left libertarianism remains an unrealistic utopia. The charge that Chomsky has never described or discussed solutions to the world’s problems is also absurd. When pressed about what economic policies he supports now, he invariably supports social democratic, Keynesian policies. That is correct. Again, rubbish. This is a caricature of Chomsky’s thought. Chomsky thinks America has done good in the world, such as fighting Nazism and helping to free East Timor from occupation. Furthermore, Chomsky praises America’s free speech and its constitutional protection of free speech, and even goes so far as to say that America’s protection of free speech is the “best in the world” (and that is his words as quoted in Mitchell and Schoeffel 2002: 268). That is sufficient in itself to damn the absurd and laughable caricature in this video. A serious charge would be that Chomsky has often gone too far in his criticism of US foreign policy, where there would be a legitimate debate, but instead we have a silly straw man thrown up in this video. The modern “regressive left” has very little to do with the thinking of Noam Chomsky. The “regressive left” is the outgrowth of French Poststructuralism, Postmodernism, Postcolonianism, moral relativism and cultural relativism. In short, this is a case of people seeing genuinely stupid and outrageous ideas on the left and needing a hate figure to blame for all this. Chomsky is not to blame, and the charges against him here are laughable ignorance. However, there are some good points in the video, and I do not deny this. It is true that some people on the left have a shameful inability to see how dangerous and extreme is the ideology of Islamism and how regressive even the non-political religious fundamentalism related to this is, and how incompatible it is with the best values of the West. It may be that Chomsky is guilty of failing to see this or failing to speak out about it. That could have been a legitimate criticism of him, but instead they focus on unfair straw man charges. Mitchell, Peter R. and John Schoeffel (eds.). 2002. Understanding Power: The Indispensable Chomsky. Scribe Publications, New York. Yes, he really was. Let’s just list some examples below. First, take the most well known one: Marx’s conspiracy theories about Lord Palmerston. Around 1854 Marx was befriended by David Urquhart (1805–1877), a British aristocrat and vitriolic anti-Russian conspiracy-theorist, who thought Lord Palmerston was a secret Russian agent (Wheen 2001: 189). Marx, who also hated Tsarist Russia, was converted to this conspiracy theory by 1853 to 1854, and, even though he met Urquhart early in 1854 and regarded him as mad, continued to uphold the view that Palmerston was in the employ of Russia (Wheen 2001: 210–211; Sperber 2014: 305–307). Marx in 1856 even took money and wrote for Urquhart’s journal the Free Press a series of sensational articles claiming to have found evidence for his anti-Russian conspiracy theories, and even arguing that the Crimean war (which occurred between October 1853–February 1856) had been a secret plot to disguise the true alliance between Russia and Britain (Wheen 2001: 211; Sperber 2014: 305–306). Even worse, Marx thought that many British politicians for over a century had been traitors in the pay of the Czar (Sperber 2014: 305–306). Needless to say, these ideas were unhinged and there has never been the slightest evidence for them, and the Soviet regime of the 20th century was deeply embarrassed by Marx’s anti-Russian fantasies (Wheen 2001: 212). Marx’s association with Urquhart continued to 1859 when he participated in anti-Russian meetings in London organised by Urquhart’s movement (Sperber 2014: 329). Another one of Marx’s conspiracy theories is analysed by Philip Pilkington here and here, and concerns the Irish famine (1845–1852). In essence, there are passages in Capital that suggest that Marx thought the Irish potato famine was a deliberate and cold-blooded secret plot by the English and Anglo-Irish capitalist elite to murder about a million people “to thin the population of Ireland down to the proportion satisfactory to the landlords” (Marx 1906: 782, n. 2). Now one can accuse the British of many things, but this is a crazy conspiracy theory, as pointed out here. The causes of the Irish famine was obviously over-reliance on potatoes, a bad natural disaster, British incompetence, fanatical support of free trade and their grotesque and callous indifference to human suffering, not secret genocidal plans to kill the Irish. But this quite clearly conjures up images of government elites in Britain or America secretly conspiring to fabricate “false flag” international conflicts and wars whenever domestic labour tensions at home became problematic. But what is the evidence for this? In fact, British and American relations became closer and closer by the late 19th century, and at the time of very bad labour tensions and violence in the 1890s Britain and America had come to have good diplomatic and international relations. So Marx’s worldview included quite bizarre conspiracy theories, such as the idea that powerful capitalist elites and traitors secretly conspire to commit mass murder and also engage in “false flag” operations to distract attention away from their evil policies at home. Hmmm, whom does that remind you of? Sperber, Jonathan. 2014. Karl Marx: A Nineteenth-Century Life. Liveright Publishing Corporation, New York. This is one of the many problems with Marx’s bizarre and incoherent labour theory of value. That is to say, things that are not produced by human labour have no real labour value (e.g., air, uncultivated soil, natural meadows) and only fetch an “imaginary” money price (Marx 1906: 115). But, since a large number of capital goods bought by capitalists must be included in the list of things that Marx thinks have no labour value, we have a severe problem here. Many such goods used in production processes that, for Marx, have only “imaginary” money prices and no labour values still from part of the monetary costs of production for capitalists and are used to calculate cost-based mark-up prices. Therefore the whole theory of exchange value in volume 1 of Capital is undermined, for goods cannot tend to exchange at pure or true labour values when many of them have prices that include mere “imaginary” money prices of factor inputs with no labour values (such as land, metals in situ, and timber in virgin forests, etc.). For example, purchase of land is by itself for many industries a major cost of production and one that needs to be recouped in the eventual money price of the output good that the business sells. This is yet another terrible problem for Marx’s labour theory of value. It was in the spring of 1895 that Engels wrote his supplement to volume 3 of Capital (Howard and King 1989: 48), a small essay which clarifies how Engels understood Marx’s law of value at the end of Engels’ life (Engels died on August 5, 1895). This was written in May 1895 for the Neue Zeit (Marx 1991: 1027, n.), which is available as the “Supplement and Addendum” to Volume 3 of Capital in Marx (1991: 1027–1047). This supplement was partly inspired by the critical reviews of volume 3 of Capital by Werner Sombart and Conrad Schmidt and the private (and more hostile) letters of these men to Engels, but also by the need to defend Marx’s theory of value from other critics and the perception that it was incoherent. To sum up, Marx’s law of value applies universally, as much as any economic laws do apply, for the entire period of simple commodity production, i.e. up to the time at which this undergoes a modification by the onset of the capitalist form of production. Up till then, prices gravitate to the values determined by Marx’s law and oscillate around these values, so that the more completely simple commodity production develops, the more do average prices coincide with values for longer periods when not interrupted by external violent disturbances, and with the insignificant variations we mentioned earlier. Thus the Marxian law of value has a universal economic validity for an era lasting from the beginning of the exchange that transforms products into commodities down to the fifteenth century of our epoch. But commodity exchange dates from a time before any written history, going back to at least 3500 B.C. in Egypt, and 4000 B.C. or maybe even 6000 B.C. in Babylon; thus the law of value prevailed for a period of some five to seven millennia. We may now admire the profundity of Mr Loria in calling the value that was generally and directly prevalent throughout this time a value at which commodities never were sold nor could be sold, and which no economist will ever bother himself with if he has a glimmer of healthy common sense!” (Engels 1991 : 1034–1038). So, according to Engels, the law of value in volume 1 was empirically true until about the 15th century. Elsewhere, however, Engels implies that it continued until the 19th century in Germany (Engels 1991 : 1035, 1044; Howard and King 1989: 49). At any rate, it is clear that Engels envisaged this as being prior to the emergence of prices of production in modern capitalism. Now what, according to Engels, overthrew the “law of value” in pre-capitalist commodity production? (3) the rise of manufacturing capitalism. For Engels, the merchant traders of the early modern period came to have an average or equal rate of profit, and this was often high (Engels 1991 : 1039–1040). Engels even saw the guild-like merchant traders as engaging in a type of “monopoly trade with monopoly profit” and competitive forces equalised the profit rate inside and between nations (Engels 1991 : 1040). This continued with the discovery of the new world and the rise of trading companies. With the rise of industrial capitalism, handicraft production and independent workers owning their own means of production gave way to capitalism. Up until this point in domestic retail trade commodities produced by independent handicraft workers still tended to exchange at their labour values (Engels 1991 : 1041). This began in shipping, mining and textiles, but continued as merchant traders also came to hire artisans and other independent workers as contractors (Engels 1991 : 1042–1044). Large-scale industrial capitalism put the handicraft and independent workers out of business and so became universal (Engels 1991 : 1044). This new capitalism was also characterised by intense competition and so there was a tendency to the equalisation of profit rates (Engels 1991 : 1044). It was at this point that prices of production became universal too, and a tendency to an average profit rate (Engels 1991 : 1044). Engels ended his thoughts with the observation that the stock market had by the 1880s taken on a fundamental and overwhelming role in modern capitalism, and allowed the growing class of idle rentiers to soar, and the rise of limited liability corporations and banks (Engels 1991 : 1046). Engels, F. 1991 . “Supplement and Addendum” to Volume 3 of Capital,” in Karl Marx, Capital. A Critique of Political Economy. Volume Three (trans. David Fernbach). Penguin Books, London. Howard, Michael Charles and John Edward King. 1989. A History of Marxian Economics. Volume I, 1883–1929. Princeton University Press, Princeton. “Under normal conditions, reductions of wages are in our time almost impossible. Even under the worst conditions, capitalists in many cases prefer to endure a diminution of their profits rather than enter upon a struggle with their organized laborers. How many corporations maintain wages unchanged, even though the stockholders – i.e., the capitalists – get no dividends?” (Lexis 1895: 16–17). It is extraordinary that an economist regarded this as already true in the 1890s. The empirical data here also shows it was generally true for the UK and the US by the 1890s. It seems clear to me that if there really was strong downwards nominal wage flexibility in America during the recession of 1920 to 1921, then this was a remarkable exception to the general rule of wage stickiness that had already become established in the advanced capitalist world by the late 19th century. The Austrian economists and libertarian idiots who make so much of this episode in 1920–1921 have mistakenly generalised from one highly anomalous case to the whole pre-1929 period. But I’m sure that none of them will ever stop pushing the same falsehood in their endlessly derivative and discredited literature and their fantasy-world blogosphere. “Malthus on Nominal Wage Rigidity,” May 25, 2015. “Henry Thornton on Downwards Nominal Wage Rigidity,” December 1, 2014. “Were Nominal Wages Flexible in 1890s and Early 1900s America?,” January 31, 2014. It follows clearly if you accept the interpretation of Marx’s law of value (as he expressed it in volume 1 of Capital) by Engels in his “Supplement and Addendum” to Volume 3 of Capital (see my discussion of it here). According to this interpretation, the view that labour values are anchors for individual prices and that prices tend to correspond to labour values can only be held to be true for the pre-modern modern of commodity exchange before about the 15th century. This law of value ceases in the advanced capitalist world where prices of production become the anchors for the price system. “The class of wage-labourers, which arose in the latter half of the 14th century, formed then and in the following century only a very small part of the population, well protected in its position by the independent peasant proprietary in the country and the guild-organization in the town. In country and town master and workman stood close together socially. The subordination of labour to capital was only formal—i.e., the mode of production itself had as yet no specific capitalistic character. Variable capital preponderated greatly over constant.” (Marx 1906: 809–810). This latter phenomenon was, according to Marx, predominant. “The exchange of commodities at their values, or approximately at their values, requires, therefore, a much lower stage than their exchange at their prices of production, which requires a relatively high development of capitalist production. Whatever may be the way in which the prices of the various commodities are first fixed or mutually regulated, the law of value always dominates their movements. If the labor time required for the production of these commodities is reduced, prices fall; if it is increased, prices rise, other circumstances remaining the same. Aside from the fact that prices and their movements are dominated by the law of value, it is quite appropriate, under these circumstances, to regard the value of commodities not only theoretically, but also historically, as existing prior to the prices of production. This applies to conditions, in which the laborer owns his means of production, and this is the condition of the land-owning farmer and of the craftsman in the old world as well as the new. This agrees also with the view formerly expressed by me that the development of product into commodities arises through the exchange between different communes, not through that between the members of the same commune. It applies not only to this primitive condition, but also to subsequent conditions based on slavery or serfdom, and to the guild organisation of handicrafts, so long as the means of production installed in one line of production cannot be transferred to another line except under difficulties, so that the various lines of production maintain, to a certain degree, the same mutual relations as foreign countries or communistic groups.” (Marx 1909: 208–210). But the whole transformation problem depends on assuming that we are dealing with an advanced capitalist economy where the organic composition of capital is highly variable in many different industries and where competition can drive the rate of profit to an average level. But if we were to accept Engels’ solution as offered in the “Supplement and Addendum” and taken from comments by Marx in Chapter 10 of volume 3 of Capital as quoted above, then it follows that the whole transformation problem as applied to modern advanced capitalism was utterly irrelevant and unnecessary, because there is no need to derive prices of production from individual labour values of commodities in the modern world. The very fact that modern capitalism has highly variable organic compositions of capital and strong competition means that Marx should have seen from the beginning that there was no transformation problem. Marx could easily have stated this in volume 1. There was no need to defer a non-existent pseudo-problem to volume 3. There was no need for Engels to announce a competition in his preface to volume 2 of Capital asking readers to try and solve the transformation problem, because there was no such problem. Of course, the reality is that Marx, when he wrote volume 1 of Capital, did actually think his theory of value there was meant to apply to 19th century capitalism. That is exactly why he and Engels did take the transformation problem seriously. Eventually, however, Marx realised that he was unable to come to any convincing solution that he wished to publish, except the ridiculous attempt to defend the law of value in an aggregate sense, which was indeed derided by his critics. His feeble attempts were later published by Engels after Marx’s death and Engels desperately looked to the passage of Marx in Chapter 10 in volume 3 of Capital I have quoted above. The new solution was then to claim that Marx’s law of value in volume 1 had never been meant to apply to 19th century capitalism in the first place and that it was only ever valid for the pre-modern modern of commodity exchange before the 15th century. If this was what Marx thought in 1867, why, then, did anyone need to worry about the transformation problem? I find it interesting that Eugen von Böhm-Bawerk was fully aware of Marx’s attempt to salvage the law of value in volume 1 by applying it only to an earlier, less developed period of capitalist production. First argument: even if the separate commodities are being sold either above or below their values, these reciprocal fluctuations cancel each other, and in the community itself—taking into account all the branches of production—the total of the prices of production of the commodities produced still remains equal to the sum of their values (III, 188). Second argument: the law of value governs the movement of Prices, since the diminution or increase of the requisite working time makes the prices of production rise or fall (III, 208, 211). Third argument: the law of value, Marx affirms, governs with undiminished authority the exchange of commodities in certain ‘primary’ stages, in which the change of values into prices of production has not yet been accomplished. Fourth argument: in a complicated economic system the law of value regulates the prices of production at least indirectly and in the last resort, since the total value of the commodities, determined by the law of value, determines the total surplus value. The latter, however, regulates the amount of the average profit, and therefore the general rate of profit (III, 212).” (Böhm-Bawerk 1949: 32). With respect to the third argument – what Engels seized on and made the centrepoint of his defence of Marx in the “Supplement and Addendum” – Böhm-Bawerk, to his credit, was not fooled by this argument. Quite simply, Böhm-Bawerk rightly noted that Marx provided no good empirical evidence for it (Bawerk 1949: 43). Furthermore, Bortkiewicz, Dimitriev and Tugan-Baranovsky showed that Marx’s first argument was untenable. The second argument simply reduces to saying that labour costs strongly influence price movements. This is a trivial observation and does not vindicate Marx’s labour theory of value. Non-labour factor input costs also strongly influence price movements even when labour prices stay the same. Even worse, this second argument is flawed by the way in which Marx held that certain types of factor inputs only have “imaginary” money prices with no true labour values (such as land, metals in situ, and timber in virgin forests, etc.). But many such goods are used in production processes that and still from part of the monetary costs of production for capitalists and are used to calculate cost-based mark-up prices, and so changes in, for example, land prices when land is a costs of production could also drive price movements. ... will this, admittedly amongst other issues, have a great deal to do with it? This is the European Union today: its policies have caused a breakdown in law and order so bad that many ordinary working people driving trucks between England and France can’t do their jobs properly and fear for their lives. The documentary below illustrates this, although it fails to ask the tough question: how many are just economic migrants, not genuine refugees. How are the policies that have led to this, and allow it to continue, left-wing? And if the National Front wins big in France in the coming days, as many suspect, will left-wing people in Europe be able to face the reality that radical changes are needed in their policies on the EU, economic sovereignty and open borders? “ As soon as this process of [sc. capitalist] transformation has sufficiently decomposed the old society from, top to bottom, as soon as the labourers are turned into proletarians, their means of labour into capital, as soon as the capitalist mode of production stands on its own feet, then the further socialisation of labour and further transformation of the land and other means of production into socially exploited and, therefore, common means of production, as well as the further expropriation of private proprietors, takes a new form. That which is now to be expropriated is no longer the labourer working for himself, but the capitalist exploiting many labourers. This expropriation is accomplished by the action of the immanent laws of capitalistic production itself, by the centralisation of capital. One capitalist always kills many. Hand in hand with this centralisation, or this expropriation of many capitalists by few, develop, on an ever extending scale, the co-operative form of the labour-process, the conscious technical application of science, the methodical cultivation of the soil, the transformation of the instruments of labour into instruments of labour only usable in common, the economising of all means of production by their use as the means of production of combined, socialised labour, the entanglement of all peoples in the net of the world-market, and this, the international character of the capitalistic regime. Along with the constantly diminishing number of the magnates of capital, who usurp and monopolise all advantages of this process of transformation, grows the mass of misery, oppression, slavery, degradation, exploitation; but with this too grows the revolt of the working-class, a class always increasing in numbers, and disciplined, united, organised by the very mechanism of the process of capitalist production itself. The monopoly of capital becomes a fetter upon the mode of production, which has sprung up and flourished along with, and under it. Centralisation of the means of production and socialisation of labour at last reach a point where they become incompatible with their capitalist integument. This integument is burst asunder. The knell of capitalist private property sounds. The expropriators are expropriated.” (Marx 1906: 836–837). Whatever you think about the tendency of capitalism towards monopoly, it is the passage at the end that is relevant here. Except it didn’t happen like this. Even 19th century capitalism was increasing living standards and there arose a new middle class of professionals, lawyers, management, teachers, technocrats and others. The size of the working class as a percentage of the population eventually stabilised. Highly developed and advanced Western capitalist states like Britain and the US proved the most resistant to communism and Marxism, and when communist revolutions broke out it was in backward Russia and China. Even the communist outbreaks in Germany and Italy at the end of the First World War were more the result of the collapse of those nations under the strain of war, and not in line with the vision Marx had predicted. An interesting analysis of current EU politics by Peter Hitchens with reference to Germany and Russia, with some good historical background. It is interesting because some of his thoughts line up with what people on the left have also argued on, for example, the Ukraine, and the absurdity of the “new” Cold war that has been ratcheted up with Russia. Keep up the good work, Noam. (1) as I have carefully documented here, the final view of Engels, on the basis of his edited version of volume 3 of Capital and the remarks of Marx there, was that the law of value in volume 1 of Capital could only be applied as an empirical theory to the pre-modern world of commodity exchange before about the 15th century (Marx 1991: 1038). (2) this means that the law of value in volume 1 – that commodities tend to exchange at their pure labour values which are anchors for the price system – was a historically contingent phenomenon existing in the “lower stage … of capitalist production” (Marx 1909: 208) and before the emergence of a higher stage of capitalism where Ricardo’s prices of production are the anchors for the price system. (3) however, in volume 1 of Capital Marx appears to hold that his law of value there does apply to the advanced capitalism of the 19th century. When he published volume 1 of Capital in 1867 he therefore committed himself to this view. (4) so either (1) his theory as it had been laid out in the three volumes of Capital (the last two being unpublished when he died in 1883) was inconsistent and incoherent or (2) he changed his mind later about the empirical relevance of the law of value in volume 1 for modern capitalism, but preferred not to publish or publicly make known this change in opinion, because he refused to publish any further volumes of Capital in his lifetime. The way in which Capital was written was very peculiar. In 1863, Marx abandoned the so-called Manuscript of 1861–1863 (from which was later taken the Theories of Surplus Value) and started the new Manuscript of 1863–1865 which was a first draft of volumes 1, 2 and 3 of Capital. My best thanks for the packages. Your offer to arrange for other material to be sent to me from France, Italy, Switzerland, etc. is exceedingly welcome, although I feel reluctant to make undue claims on you. I don't at all mind waiting, by the by, nor will this in any way hold up my work, for I am applying myself to various parts of the book in turn. In fact, privatim, I began by writing Capital in a sequence (starting with the 3rd, historical section) quite the reverse of that in which it was presented to the public, saving only that the first volume—the last I tackled—was got ready for the press straight away, whereas the two others remained in the rough form which all research originally assumes. …. (letter from Marx to Sigmund Schott of 3 November, 1877; Marx and Engels 1992: 287). In 1865 Marx completed a first draft of volume 3 (McLellan 1995: 304) and then turned to a fresh draft of volume 1, which was in fact a second draft of that first volume (as pointed by Michael Heinrich here). In February 1866 after being pressed by Engels, Marx agreed to finish and publish volume 1 first (McLellan 1995: 306). He promised to send the first parts of the manuscript to the publisher in November 1866 (McLellan 1995: 306) but took the full manuscript to Hamburg himself in April 1867 (McLellan 1995: 306). It is likely that, under pressure from Engels to produce a work in defence of communism, Marx’s ideological commitments skewed volume 1 so that it presented capitalism in the worst light possible and an extreme and dogmatic defence of the labour theory of value, which, in view of his work on the draft of volume 3 of Capital, he knew to have severe problems, such as the transformation problem. Nevertheless, he published this dogmatic version of his theory. As has been pointed out time and again, Marx never bothered to publish volume 2 and 3 of Capital in his lifetime, and the suspicion is that he never did so because he was unsatisfied with his attempts to defend the dogmatic labour theory of value in volume 1 from the problems he knew plagued it. Critics at the time noticed the severe and devastating contradiction. And the cult of Marxism ever since has been trying to reconcile and harmonise Marx’s work, with all sorts of desperate tricks and sleights of hand. McLellan, David. 1995. Karl Marx: A Biography (3rd edn.). Macmillan, London. Marx, Karl. 1991. Capital. A Critique of Political Economy. Volume Three (trans. David Fernbach). Penguin Books, London.